The Lightner family claim that Abraham Lincoln was a frequent visitor to their home while he was visiting Thebes. 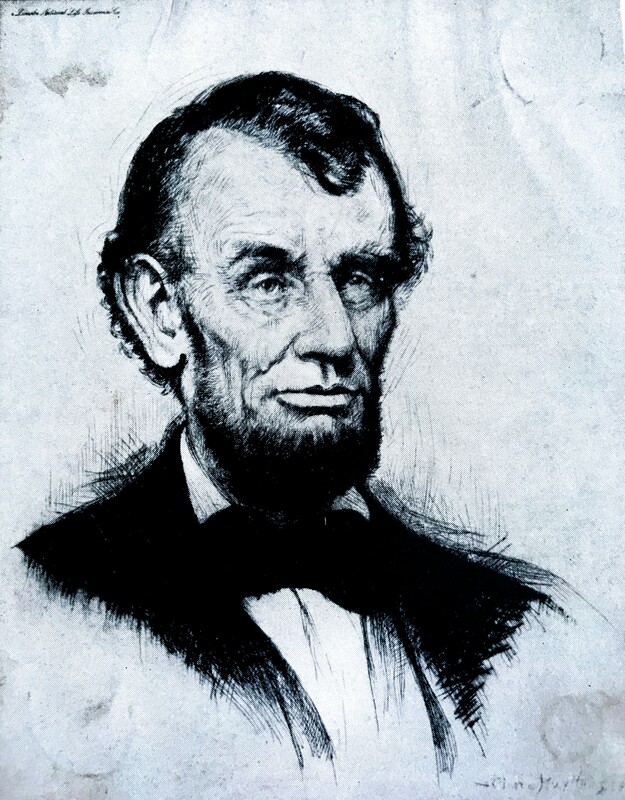 Although there are no known official records that place Lincoln in Thebes, many other orators such as Douglas, Logan, Breeze, Allen, and Trumble have been recorded as offering their pleas at the courthouse. 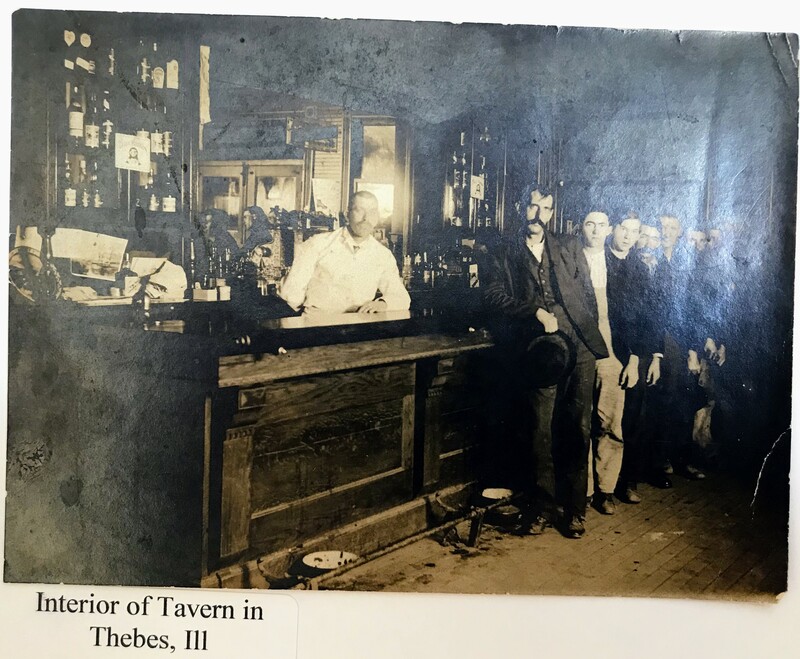 Considering how well traveled Abraham Lincoln was, it is difficult to imagine that he would not have visited Thebes on more than one occasion. Photo from a scrapbook at the Thebes, Illinois Courthouse. Children on a field trip in their finest posing before the old wooden steps that led to the upper town level. Photo from a scrapbook at the Thebes, Illinois Courthouse. Thebes had three major railroad stations at one point. In the background on First Street is a large brick hotel and station owned by C. & E. I. Railroad. Notice the windmill at the house at the end of Third Street. 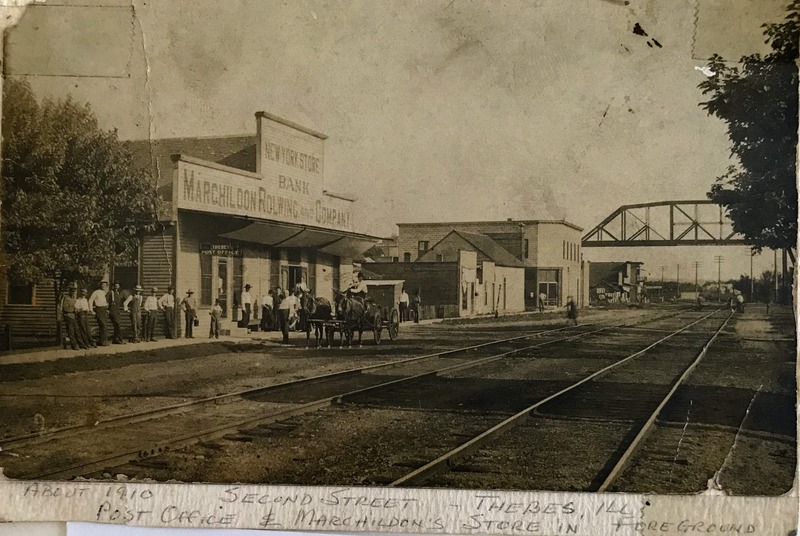 During this time there were eight saloons, a movie theater, numerous stores, restaurants, drug stores, barbers, a barrel manufacturing plant, brick yard, drug store, lumber yard, and dairies for buying ice cream. Photo from a scrapbook at the Thebes, Illinois Courthouse. 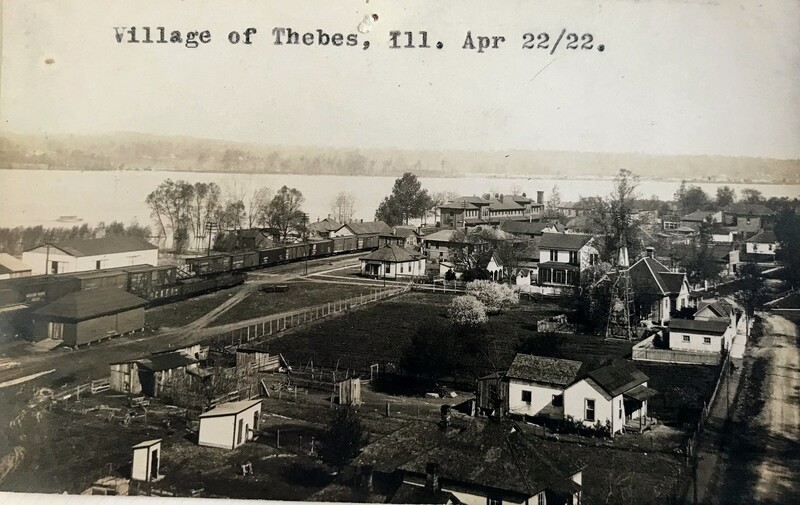 Thebes Illinois was thriving after the railroad bridge was built. In this photo it can be seen that development across the river was also thriving. 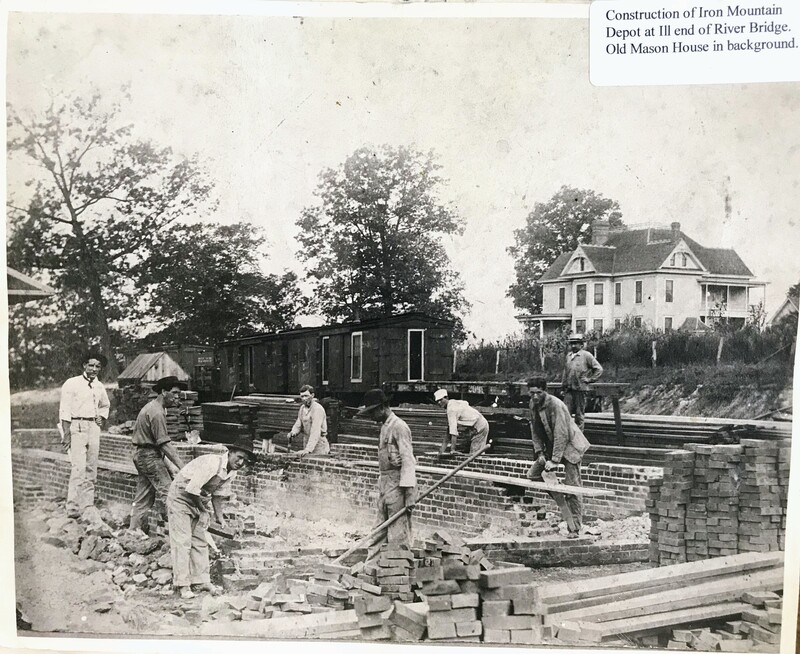 Photo from a scrapbook at the Thebes, Illinois Courthouse. 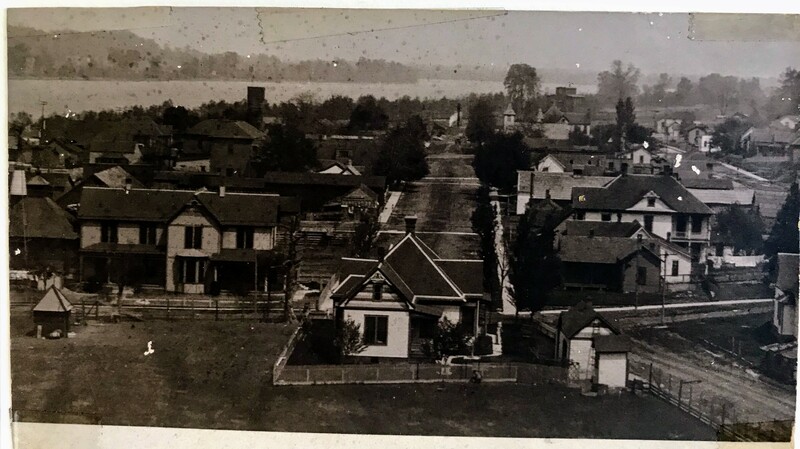 Thebes was a bustling river port town with nice homes soon after the new railroad bridge was built. 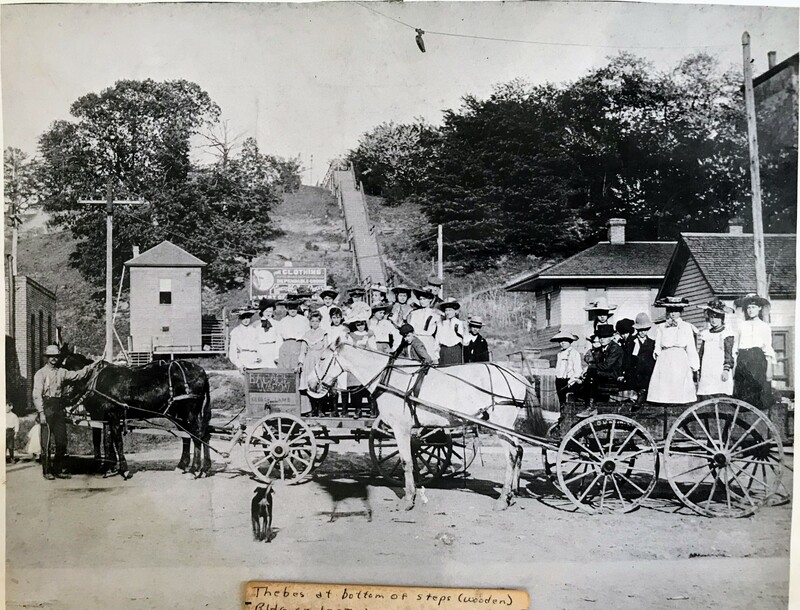 Photo from a scrapbook at the Thebes, Illinois Courthouse. The Marchildon Rolwing and Company building is in the foreground. Also visible is the Thebes Post Office and the River Bridge. The double railroad tracks were near the waterfront. Photo from a scrapbook at the Thebes, Illinois Courthouse. Thebes had eight taverns at one time or another. This photo shows the interior of one of them. Photo from a scrapbook at the Thebes, Illinois Courthouse. 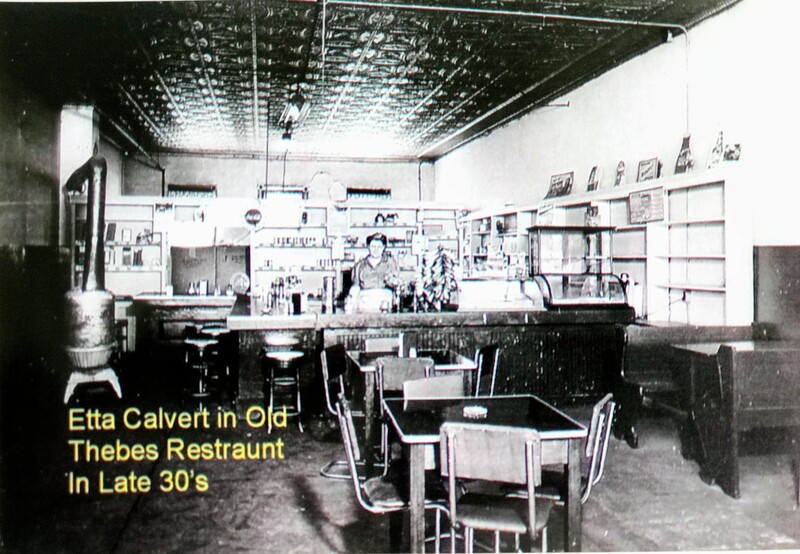 The photo shows Etta Calvert in an old Thebes restaurant from the 1930s. Photo from a scrapbook at the Thebes, Illinois Courthouse. The Iron Mountain train depot was built at the Illinois end of the River Bridge. The old Mason house is in the background. Photo from a scrapbook at the Thebes, Illinois Courthouse. This C. & E. I. 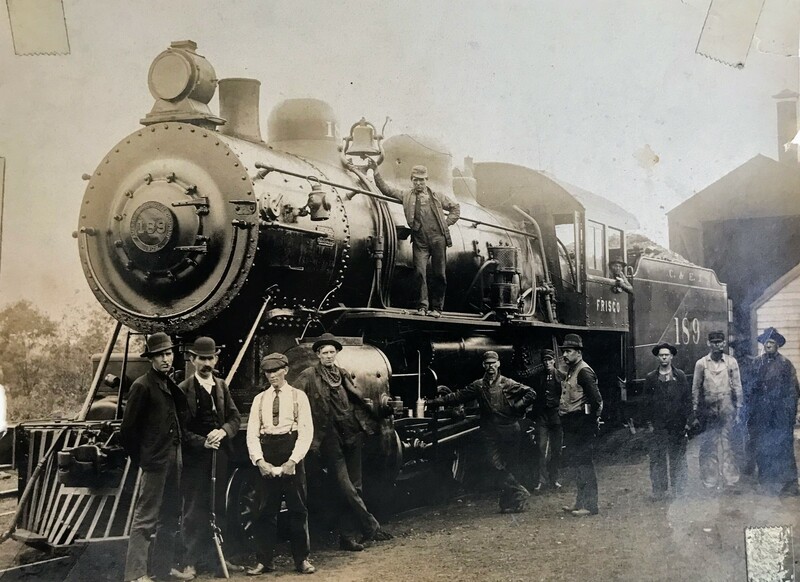 Railroad steam locomotive was parked at Thebes, Illinois. Photo from a scrapbook at the Thebes, Illinois Courthouse. Photo from a scrapbook at the Thebes, Illinois Courthouse. Taken in 1890, this photo shows Thebes as it appeared before the iconic railroad bridge was built. Cargo from the trains had to be unloaded and transported across the Mississippi River by ferry. Photo from a scrapbook at the Thebes, Illinois Courthouse.